I’m now at a middling state university (quite a contrast to my native Hillsdale, I must say), and the culture is similarly infantilizing. The graduate-student government, headed by one President Lincoln (now, there’s an irony! ), sends out emails urging us to vent our traumas. (I have a stipend. No, thanks.) At the student health clinic, the principle of harm reduction runs rampant, and the university all but showers complimentary condoms on those who enter. 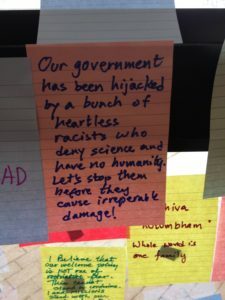 A few weeks ago, two groups of agitated students decided to occupy the administration building, and the university president caved immediately to their demands, which included establishing a “basic needs center” and removing a supposedly offensive mural. Yes, the lunacy of campus culture leads me to despair. But I think conservatives tend to overestimate its scope. At a few institutions known for their progressive politics, the rot is indeed deep. At the average state school, it infects only a tiny fraction of the student body. (Fewer than 100 students — in a population of more than 20,000 — partook in the occupation described above.) As always, those who yell the loudest receive the most attention, and they wield power disproportionate to their size. The apathy of the average student enables such antics. It doesn’t mean, though, that the average student, or even the average employee, care much for them. I’ll give one example. My professors are invariably left-leaning, scattered between Biden and Bukharin on the political spectrum. But even they have little patience for the snowflakery so decried by conservatives, and they, too, whinge about the ever-worsening quality of their students. They may agree, in theory, with the picket-wielding radicals, but they practice an older, saner, less-activist form of teaching. The exhortation “Grow up!” ever lingers on the tips of their tongues. The culture of melodrama, decadence, and political correctness is only a part of a larger tragedy afflicting the American university. I can walk from my apartment to the far end of campus without passing a single piece of evidence that this place is, indeed, an institution devoted to scholarship. Rarely, if ever, do I pass any advertisement for an upcoming lecture. Traditional academic events happen, of course, but they’re advertised only within departments. The school’s green spaces are festooned with signs for fashion shows, football games, dog-petting events, and free chlamydia screenings. The modern university is so massive and so fragmented, and its constituent parts so specialized, that all-purpose has vanished from it. It exists only for its own sake. It functions as little more than a holding pen for the emotionally and intellectually immature teenagers who flock to it because . . . well, what else are they supposed to do? It’s a high school with a bunch of graduate departments attached. Every year, many tens of thousands of 18-year-olds indebt themselves to an institution they don’t particularly care about, sit in classes that don’t particularly interest them and leave not particularly wise, capable, or knowledgeable, all because social pressure demands it. A few are radicalized; most shrug their way through. Which is worse? I’m not sure. * I have visual proof, but I don’t care to post it. I would support efforts to disallow public funding for all of the extracurricular activities, including sports. Not that it shouldn’t be there, but should not be funded from tuition, student fees, dorm expenses or anything a student is compelled to spend to earn a degree, or the taxpayer is gouged for the infrastructure/expenses to deliver that education. Burwick Chiffswiddle: The modern university is so massive and so fragmented, and its constituent parts so specialized, that all purpose has vanished from it. It exists only for its own sake. It functions as little more than a holding pen for the emotionally and intellectually immature teenagers who flock to it because . . . well, what else are they supposed to do? It’s a high school with a bunch of graduate departments attached. And, isn’t it fascinating that Hillsdale acknowledges the immaturity of its students (parents are not just permitted to see their kids’ grades — we’re encouraged to! ), but it graduates competent, capable adults? Drew Klavan points out leftism doesn’t work because it doesn’t see things as they really are. Which is another way of saying, it’s just nuts. I will never understand why the first student protests were tolerated. If someone ‘occupies’ an office they are tresspassing. And on top of that they are enrolled at the institutions pleasure – more to the point, expelled at the institutions pleasure. Imagine explaining to your parents or banks that you just flushed ten-thousand dollars because you were so offended you had to break the law. Children – hell, humankind in general – will try to live up or down to whatever target you give them. We should consider making adults again. The modern university is so massive and so fragmented, and its constituent parts so specialized, that all purpose has vanished from it. It exists only for its own sake. It functions as little more than a holding pen for the emotionally and intellectually immature teenagers who flock to it because . . . well, what else are they supposed to do? It’s a high school with a bunch of graduate departments attached. Every year, many tens of thousands of 18-year-olds indebt themselves to an institution they don’t particularly care about, sit in classes that don’t particularly interest them, and leave not particularly wise, capable, or knowledgeable — all because social pressure demands it. A few are radicalized; most shrug their way through. Gossamer Cat (View Comment): Beautifully expressed. There are 100 of you here and 20,000 at this institution. Please provide me with some objective evidence that you understand and represent their views. If you claim to speak for a minority segment of this population, then provide me evidence that you have attempted to contact those you claim you represent and that they have your support. Please include in this analysis evidence that you understand the costs of these actions on your tuition and those who come after you, and that your constituency also understands these costs. I doubt their vocabulary would allow them to understand this. I can walk from my apartment to the far end of campus without passing a single piece of evidence that this place is, indeed, an institution devoted to scholarship. Rarely, if ever, do I pass any advertisement for an upcoming lecture. Traditional academic events happen, of course, but they’re advertised only within departments. The school’s green spaces are festooned with signs for fashion shows, football games, dog-petting events, and free chlamydia screenings. The modern university is so massive and so fragmented, and its constituent parts so specialized, that all purpose has vanished from it. It exists only for its own sake. It also exists for the sake of the government. There’s plenty of research going on, but it doesn’t much connect to teaching and, as you note, students know little of it. The research is largely there to justify government funding. The government bureaucrats don’t know how to measure whether the alumni know the rudiments of math, scientific method, some currently dominant scientific theories, a few major philosophers, Shakespeare, the Constitution, American history, and so on. They sure as heck know how to measure whether they channeled a lot of grant money to the professors, and whether the professors produced items of research that got published in prestigious journals. But there’s very, very little incentive for the professor to write anything anyone reads, or to be a better teacher by researching. Curious: How often do more rational students, perhaps republican leaning, file complaints of bias incidents in response to bulletin boards such as the one pictured or described? Follow the links, and you’ll find quite a few. I did and didn’t see anything relevant. Maybe I missed it. “Being told my religion makes those around me uncomfortable and only being confronted about an issue with the survey after it was revealed as a faith based religious survey leads me to fully believe I was discriminated on based on my faith and religion,” the female student wrote. According to the university’s records, the student ceased cooperating with the university and the investigation into the incident was closed with no action. The whole system needs to be completely atomized. Start over. If the liberal arts don’t develop your human capital and help you learn about the world you shouldn’t be forced to take them. If you separated the liberal arts from the stuff you actually make money off of, things will improve in a hurry. The whole thing. Sheldon Adelson or whoever could fix this in a minute. Back in 1991 or so, at the University of Vermont (when I was a wee lad), some students held a sit-in/occupation of the president’s office. They barred the door, etc. I think this was over George Bush/gulf war stuff, might have been divestiture in south africa, well, take your pick. They wouldn’t speak to the president. So, he had staff put a ladder to the outside of the building, and he climbed up it, in order to have a conversation with the students, hear their words, etc. I think he was gone within a year. From my perspective, you ask facilities to take the doors off your office, and the Kampus Kops to remove the brats, and then expel them for breaking laws. Instead, they were swathed in empathy from the academics on campus, and the hippie clowns in town. The rest of campus thought they were idiots. And we were right. Worse, we were pretty amazed the admin listened to any of their idiocy, but if you walked through the student union in those days, all the office space that’s devoted to campus orgs was like walking through a Mall of Aggrievance. I was walking through there to play Smash TV between classes, but hey, that’s just me.